Realising that the fight is over, Komamura brings Dangai Joue back down and chooses his next target – the Vandenreich castle. However, he barely manages to move one step before his Bankai falls to its knees and begins to disintegrate. It turns out that his Human Transformation Technique has a timer on it, and it has only just run out. 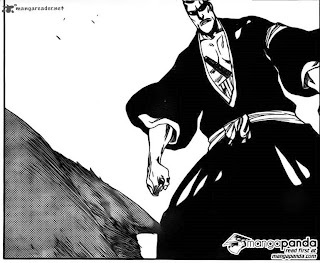 As he tries desperately to reach the castle and defeat Yhwach, his great-grandfather states that everything is fine. He wonders if Komamura has realised that he desires revenge, and says that Komamura once told Kaname that revenge is a useless sacrifice of one’s life. Instead of calling him a hypocrite, he says that it’s okay, and that revenge is what their clan is made for. As Komamura looks on, his body becomes less and less human-looking, and his arm changes into the leg of a wolf. "Cool! .....Wait, my opposable thumbs! NOOOOOOO!!!" He realises that this is the penalty for using the Human Transformation Technique, and his great-grandfather confirms this. To be honest, I don’t really understand what the great-grandfather says here, but to me it seems as though he still lives for revenge, and thanks Komamura for this. Whilst he says this, Komamura’s transformation has completed, and he’s turned into a full-on wolf. 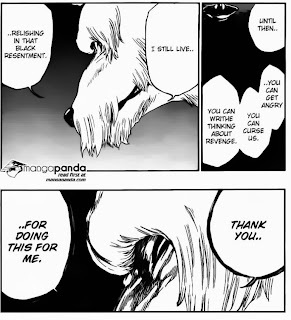 As he lies on the ground wondering if this is karma, his Lieutenant Tetsuzaemon appears and picks him up, whilst saying that he isn’t wrong, and claiming that they will go and defeat Yhwach. 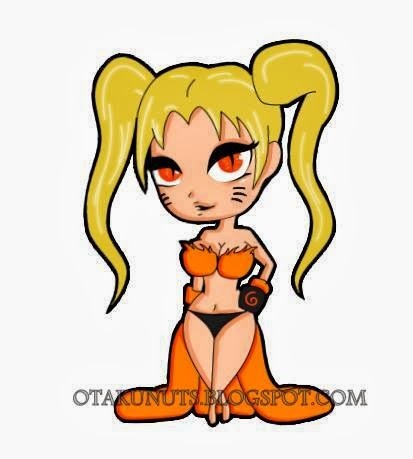 ".....But if I kill him, then I can be Captain...."
Lying in a smoking pile of rubble, Bambietta seems fairly annoyed that she lost to a Soul Reaper, and questions why she was the first of her group of five to get beaten. As she gets worked up and says that she can’t forgive this, she becomes aware of four shadows hanging over her. She looks up and sees her four subordinates looking at her, and Giselle says that they’ll help her. Things suddenly get quite sinister as Giselle goes on to say that the four of them are sad when Bambietta isn’t with them, whilst her face is half-hidden by shadows. This is followed by Bambietta begging Giselle not to do…whatever it is she’s going to do, while apparently on the verge of tears. Yeah, if anyone could help me make sense of what he's saying, it would be a huge help. Answers on a postcard. Finally, we’re treated to a page of two objects falling down through the sky, which turn out to be Rukia and Renji. 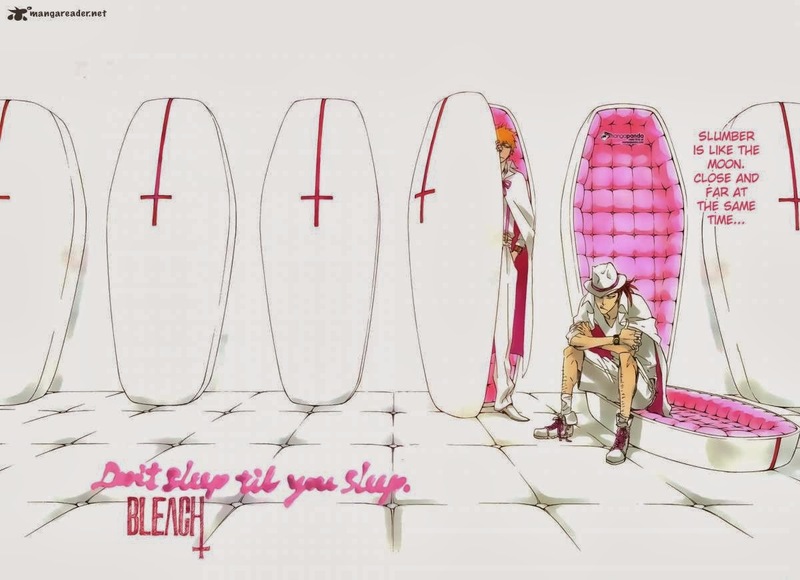 As Rukia says that she can finally see the Soul Society, Renji corrects her, telling her that it’s now more correct to call it the Vandenreich instead, since the Quincies transposed their home realm on top of the Soul Society. After noting that night will come soon, Rukia tells Renji to hurry up. "And you don't want to make us sad... You never want to make us sad...."
So, Komamura has now gone the other way and transformed into a small, helpless wolf. 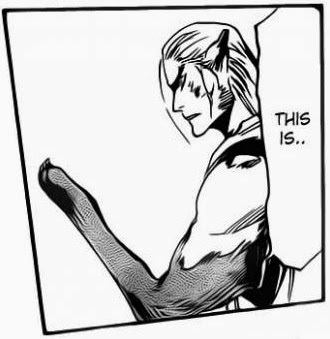 I can’t really see this as being a good thing, as not only has this pretty much taken him out of the fight, but it also means that he’s probably going to spend the next few chapters moping around without doing anything until he either returns to his ‘doggie’ form, or dies somehow. I don’t particularly want Komamura to die, especially now that he’s tiny and furry. It would just seem cruel to make him as helpless as he is, and then kill him off. Yeah, you don't have a Bankai and your Captain can't even hold his Zanpakuto any more. Let's see how well that works out for you. 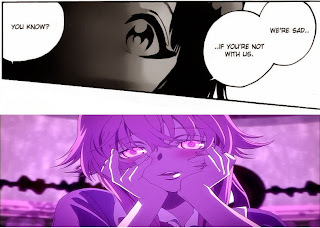 Probably the most interesting thing about this week’s chapter was the interaction between Bambietta and her subordinates, particularly Giselle. One thing that immediately hit me was that Bambietta was scared. We’ve never seen her even the slighted bit scared before, not even when she was lying in the rubble earlier on, about to die. Whatever Giselle is going to do, it’s something so bad that Bambietta appears to fear it more than she fears dying. With regards to what Giselle actually plans to do, I’m betting it involves healing Bambietta in some way. Given as well that Giselle has the letter ‘Z’, it might stand for ‘zombie’, and so she might end up bringing Bambietta back as a zombie…somehow. I’m not too sure how it would work, or if it’ll even happen, but it’s a theory nonetheless. 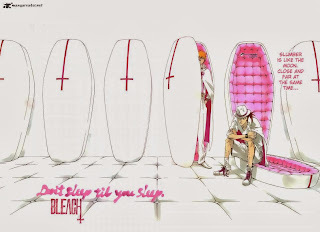 So yeah, Ichigo and Renji are Quincy vampires now. Good times. Good Things: Some more character development on Komamura’s part. Tetsuzaemon might be useful for once. Interesting mystery regarding Giselle’s intentions. Where the hell are Momo and Shinji?! ClayDragon is currently studying Physics at university, and is constantly bewildered by it. The main method of contacting him is his Gmail account at kyleroulston1993@gmail.com. The alternative is his Skype account at kyleroulston1993. When not playing games or reading, he can be found with his head in his hands whilst trying in vain to understand quantum physics. #SaveTheDay. Well, where the hell are Chad and Orihime?! Also, the colour page: Don't sleep til you sleep.